NOTICE: The "Liberty Imports" seller is the only authorized seller, we do not sell wholesale so there should be NO other sellers; Any other sellers are illegally selling their own products using our registered Trademarked company name. In this listing, purchasing from any seller other than "Liberty Imports" will result in a potentially faulty product that may be unsafe and cause injury. Please be sure to purchase this product from the "Liberty Imports" seller to avoid any problems with your product and to ensure both your safety and satisfaction. Thank you. 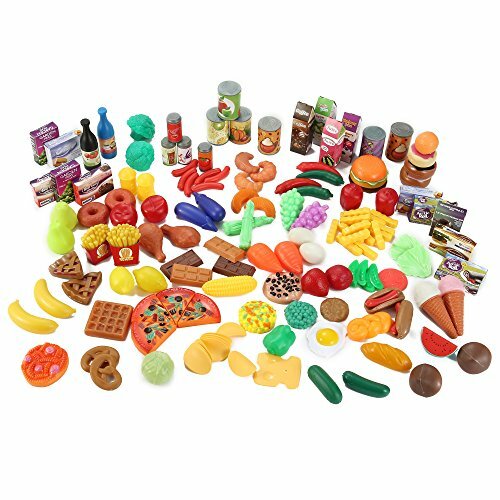 150 Pieces Play Food Assortment - Huge Variety! Huge variety of food items including fruits, vegetables, fast food, burgers, hot dogs, pizza, breads, desserts, pastries, ice cream, beverages, and more! Great for pretend play breakfast, lunch, and dinner! If you have any questions about this product by Liberty Imports, contact us by completing and submitting the form below. If you are looking for a specif part number, please include it with your message.